It's kind of amazing that Don of Division Street's mostly known for being one of Portland's in demand drummers. 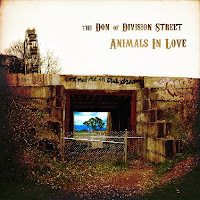 Maybe that will change with Animals In Love, an album full of engaging Americana songwriting. It ebbs and flows from mid tempo alt. country pop to slower folk to plugged in roots rock, like on "You're Gone". Regardless of the style, Matt Cadenelli's voice rich vocals that adds depth to the songs. The two standouts are the beautiful and rolling "Mina Bird" and "I Never Crawled", which, with its Memphis-style horns and backup singers, reminds me a little of Tift Merritt's forays into blue-eyed soul on Tambourine. While the album lags a bit in the middle with three back to back slower tracks, most of the songs pleasantly accessible, like the warm and yearning "When I Release Me" or the loping "Mourning Light". As far as I can tell Don of Division Street doesn't really tour, which is a shame, since as good as these songs are, they are even better live. I saw him at his record release party at the Secret Society Lounge, a beautiful old fraternal lodge. Supported by a massive band of his friends, dressed in three piece suits, they looked like they had just walked of the Deadwood set. It was a great set. They're playing a Thanksgiving Rock Buffet at Mississippi Studios next thursday, which I'd probably check out if I was in town. My first real exposure to them was live and they are great. The more I listen to this album, the more I love it! Actually, it looks like plans have changed. Don of Division Street is playing this Saturday at Mississippi Studios for $8.